Audi may have been a forefather of four-wheel drive road cars, with its legendary quattro system, but the Q7 was its first ever production SUV. Audi may have been a forefather of four-wheel drive road cars, with its legendary quattro system, but the Q7 was its first ever production SUV. It used the same platform as the Porsche Cayenne and Volkswagen Touareg, and was heavily biased towards road use - despite its central locking differential and adjustable air suspension. Set to do battle with the Land Rover Discovery and BMW X5, it may not be as practical as the former, but its every inch as prestigious as the latter. There’s only one body style available for the Q7, but there’s still plenty of choices to be made if you’re considering buying one. For a start there’s the standard five-seat model, and the option of those with seven chairs for extra practicality. Then there’s the engine choice. There was never a petrol option officially available in Ireland, but buyers could choose between the 3.0-litre V6 and 4.2-litre V8 TDI diesels. The latter is pretty rare on the used market, but nowhere near as hard to find as the mammoth 6.0-litre V12 TDI - a car that originally cost nearly €200,000 when new! All versions are fitted with an automatic gearbox, as a manual was never offered. Early cars were fitted with a six-speed Tiptronic unit and the latest an eight-speed unit. Trim levels run from the standard car through the upgraded SE spec to the S-Line models with sportier styling and larger wheels. 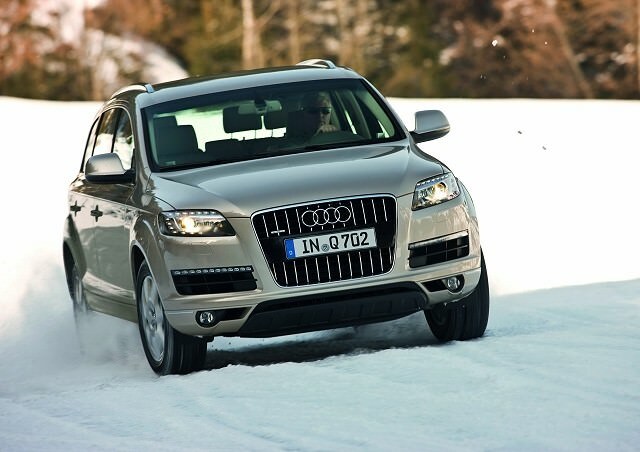 The Q7 has been facelifted a number of times, once in 2009 and then again only at the end of 2011. If your budget stretches far enough, a post-2009 model is worth searching for thanks to its neater styling and upgraded interior design and details - it’ll also be worth more should you come to sell it on. Though the larger engined models (especially the 6.0-litre V12) offer impressive performance, they are rare on the used market and the 3.0-litre V6 diesel is without doubt the best bet. Look for an SE variant, as the larger S-Line wheels can make the ride especially firm, but bear in mind that many Q7s will have had their specification supplemented by plenty of option-box ticking at time of sale so each one will be different. They look best in dark colours, inside and out, and make sure you check for bodywork damage - they are a big car and often suffer from car park scrapes. If you’re looking for an off-roader then the Land Rover Discovery 4 is a better shout, as is the BMW X5 if you plan to stick to the tarmac. However, the Audi Q7 does a passable impression of both, and offers an interior quality only just matched by its latest rivals. Nonetheless, it’s not particularly common on the used market, so be prepared to search long and hard to find the right car for you.